The Budokan of LA will be constructed at the corner of 2nd Street and Los Angeles Street. A gymnasium that has been planned for Little Tokyo since the 1970s finally has a home. On Tuesday, the LA City Council approved a lease for city-owned land, allowing planners to move forward with a project that has been in the works for decades. 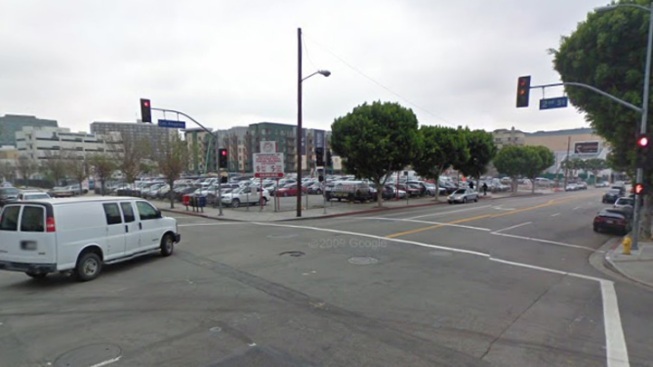 The proposal, sponsored by the Little Tokyo Service Center, calls for a 38,000-square foot facility on a city-owned parking lot at Los Angeles and 2nd streets. "The idea has been floating around for a number of years, going back to the 1970s," said Bill Watanabe, of the Little Tokyo Service Center. "It was a huge step. Getting a site is really the first big step, and finding a site that's almost an acre in size has not been easy. Finally, to have it happen -- we were celebrating all day long." The LTSS has been talking with the city about the site for about seven years. The gym, just east of downtown, will be called the Budokan of Los Angeles. The strict translation means "martial arts center," but Watanabe said the gym will be used for many activities -- basketball, volleyball, dance, fitness and martial arts. "We really do need this kind of facility in downtown LA," Watanabe said. "Partly, for Little Tokyo itself, because we want to preserve an historic ethnic neighborhood and build something attractive to young people. At same time, downtown is so lacking in parks space and recreational facilities, it would be huge plus for people living in and around Little Tokyo. "We think this Budokan of LA could become a premiere exhibition venue for martial arts." A poll on the LTSS website asked visitors what types of activities they'd like to see at the Budokan. As of Tuesday afternoon, kendo and basketball were the preferred activities, but judo, karate, tennis and volleyball all received support. Watanabe said the fundraising effort will need to come up with about $20 million. The project includes four courts and a parking garage. "We have talked to many people over the years, and there is a long list of folks who said, 'We're interested, come back to us when you have the land,'" he added.